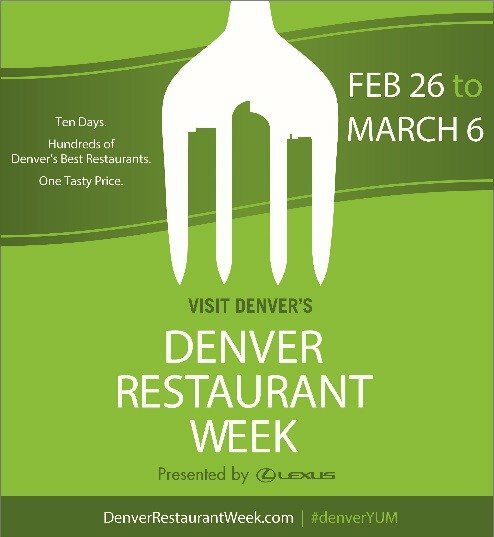 Come and celebrate Denver’s 12th Annual Restaurant Week February 26 – March 6, 2016! Over the course of 10 days, hundreds of Denver’s top restaurants are offering multi-course dinners for the appealing price of $30 per person. This long week is a great opportunity for Denver foodies to experience a crash course in Mile High Dining on the cheap. 1. Browse the Menus: All participants are listed and restaurants are added to the list as they sign up, so be sure to keep going back for the latest information. 2. Make Reservations: Tables fill up fast during Denver Restaurant Week, so make your plans soon. Be flexible, and try some earlier or later seating’s also. Be sure to cancel any reservations that you do not use. 3. Dine Early and Often: With hundreds of Denver’s best restaurants participating, there is never a better time to try a new spot, or return to one of your favorites. 4. Splurge: Many of the participating restaurants offer affordable wines, special desserts, and add-ons. And at $30 per person, you can afford to order some extras! 5. Pay It Forward: That fabulous meal that you just had is also a great deal. Be sure to tip your server, generously!